This past weekend the family and I went to the Children’s Museum in Everett. Before we left I thought I’d check Google to see if any new breweries had popped up. The closest one was At Large Brewing Company. I gave them a call and they said they did have their own root beer on tap. It was only a 15 minute walk away, and the weather was nice, so off we went to get some brew. At Large Brewing has only been open since Memorial Day, and doesn’t yet have a proper restaurant. Their root beer is from a custom made Cascade Beer Candi Syrup flavor, which they then mix and carbonate at the brewery and serve on tap. It’s called Designation Root Beer for some reason. I should have asked. Their tap room is kid friendly and had a bean bag toss game. They also serve hot dogs and pretzels with plans to expand to a full restaurant some day. The Body is sweet with a strong wintergreen flavor that has some bitter notes. It’s like those standard dark/old fashioned root beers without any licorice. The Bite is sharp and spicy, from clove I think. 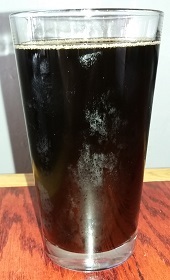 There is not really any Head at all, but there is good carbonation. The Aftertaste is more wintergreen that ends a little bitter. This is okay, but a little one dimensional. It’s like half a root beer, a good half to be sure, but there should be a strong vanilla flavor or a (very) light licorice flavor or something to go with that wintergreen and clove. It’d make a nice float though, which they also serve there, so I can see this being a hit in that combo, but I think I’ll pass on it plain next time I’m in the neighborhood. The different taps. Root Beer is the far left.